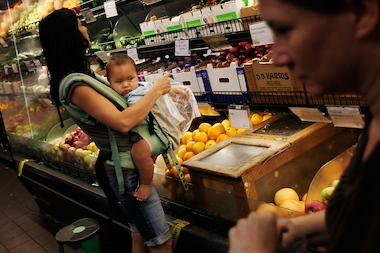 Shoppers at the Park Slope Food Coop. A central Brooklyn food cooperative has voted to adopt the Park Slope institution's co-op model. BROOKLYN — A new central Brooklyn food cooperative will model itself on the famous Park Slope market when it launches next year, organizers said. Board members of the still-unnamed central Brooklyn food co-op, organized by Bed-Stuy nonprofit Brooklyn Movement Center, voted 10-7 in favor of adopting a model used by the Park Slope Coop and Clinton Hill's Greene Hill Food Co-op, organizers said. They would require all shoppers to be members and for all members to work a minimum number of hours every month. All members would also have an ownership stake. The member-worker-owner system beat out another structure modeled on cooperatives like ones in Bushwick and Flatbush, which allow non-members to shop as well. "People were split," said organizer Harvir Kaur, 25, who did not vote, adding that thePark Slope model, "was more about the cooperative culture." With the model chosen, organizers can now begin outreach to the community, Kaur said. "This conversation has been in the works for quite a bit now, ever since we began our food co-op organizing process," Kaur said. "That decision is very important to the next work we're going to do." Organizers are aiming for a March 2015 opening, Kaur said. They have not yet selected an exact location. For some members, the model decision was a difficult one. One concern was that making the co-op members-only would discourage some people from shopping for healthy foods. Shatia Strother, chairwoman of the co-op's outreach and membership committee, said she was originally unsure what her decision would be, but ultimately decided to vote for the winning model, reasoning that a members-only system would be easier to change if it didn't work. "For a little while I was on the fence," said Strother, 29. "In the end I decided members-only was the best way to go." Next on the agenda is choosing the co-op's name, which organizers hope will be done by June. The ultimate goal is to provide access to affordable healthy foods in Bed-Stuy and Crown Heights, Kaur said. "We saw in this neighborhood that the food systems that exist aren't by us and for us," Kaur said. "We saw a food co-op as fulfilling that context."